Natural Pink Tourmaline Rings in 14k gold, Sunset Tourmaline Rings, and 925 sterling silver pink tourmaline rings. 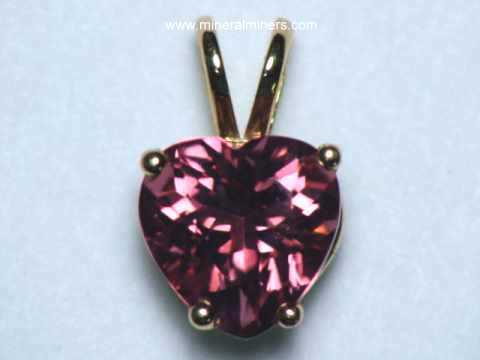 Try our Natural Color Pink Tourmaline Rings Satisfaction Guarantee - compare our pink tourmaline jewelry prices and our superior quality. Click on any pink tourmaline ring to enlarge it. This solid 14k gold ring is set with a 6.1mm round faceted natural pink tourmaline gem. 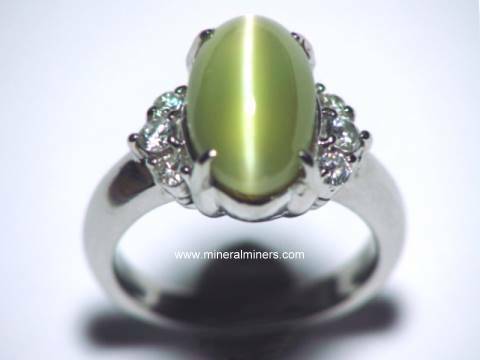 This fine quality gem has no visible inclusions, even under close inspection with magnification. 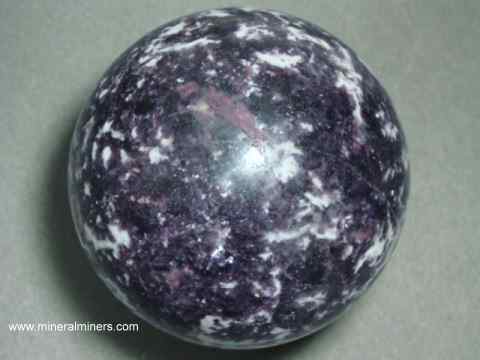 This beautiful gem has fine medium pink natural color under reflected sunlight as shown. 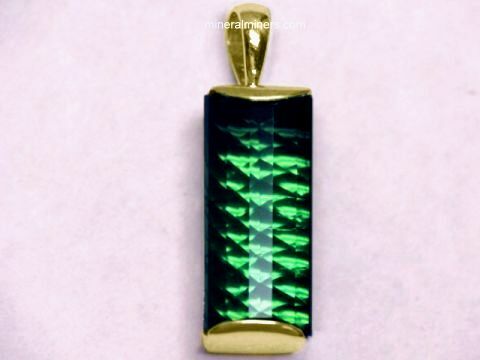 This natural tourmaline gem is both unheated and untreated. This ring is a size 7 and has 4.52 grams of 14k gold! See another photo of this natural color pink tourmaline ring. 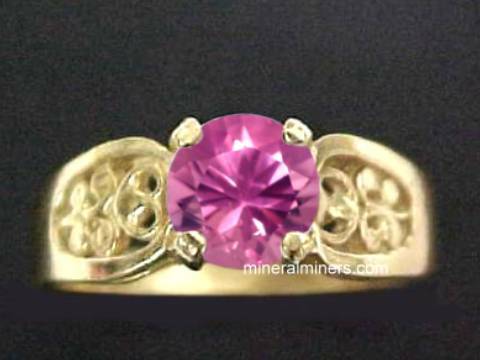 See also an additional view of this natural color pink tourmaline 14k ring. This solid 14k gold ring is set with an oval faceted natural pink tourmaline gemstone. 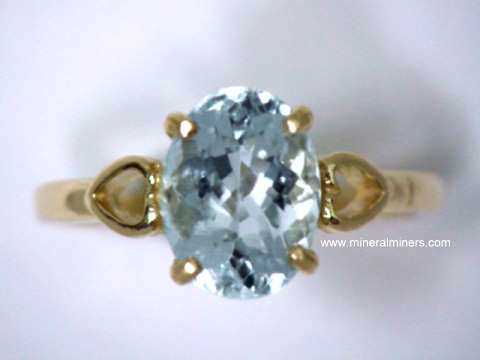 This fine quality gem has no visible inclusions, even under close inspection with magnification! 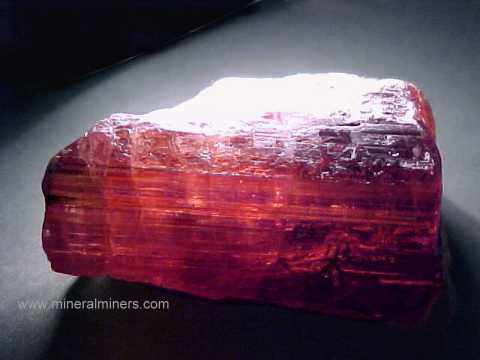 This beautiful gem has fine medium dark red-pink natural color under reflected sunlight as shown. Under incandescent light this wonderful gem shows beautiful peach-pink or sunset hues. 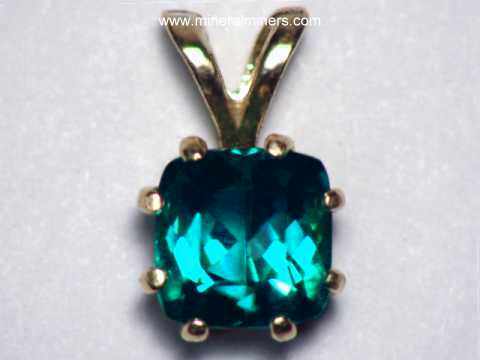 This natural color tourmaline gem is both unheated and untreated. This ring is a size 6.5 and has 4.7 grams of 14k gold. See another photo of this natural color pink tourmaline ring. See also an additional view of this natural color flawless pink tourmaline ring. See also an additional view under incandescent light showing the pink-peach colors in this beautiful sunset tourmaline ring. 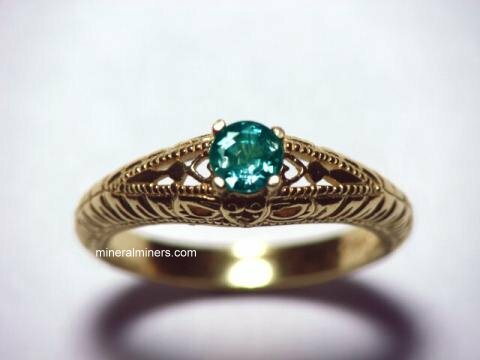 This solid 14k yellow gold ring is set with a natural pink tourmaline gemstone. 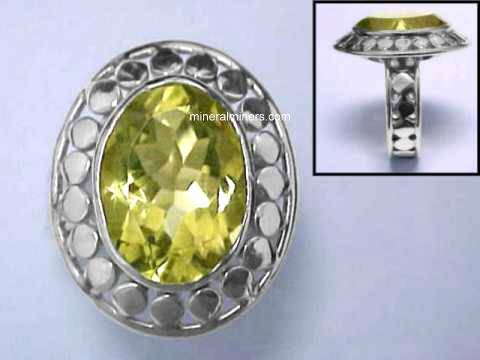 This gem was expertly faceted in a roll top octagon cut with a concave faceted back. 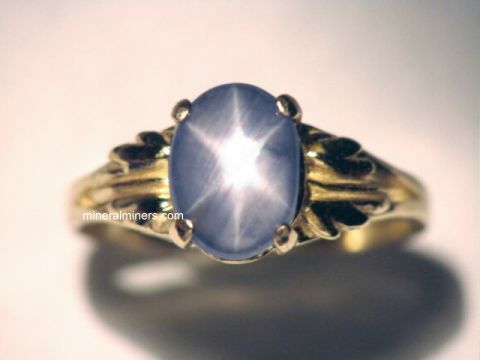 This fine quality gem has no visible inclusions, even under close inspection with magnification! 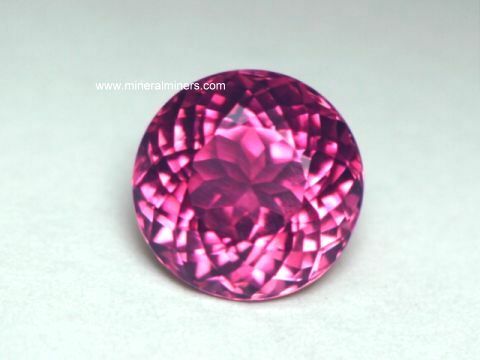 This beautiful gem has lovely pink natural color under reflected sunlight as shown. Under incandescent light this beautiful gem shows wonderful peach-pink or sunset hues. 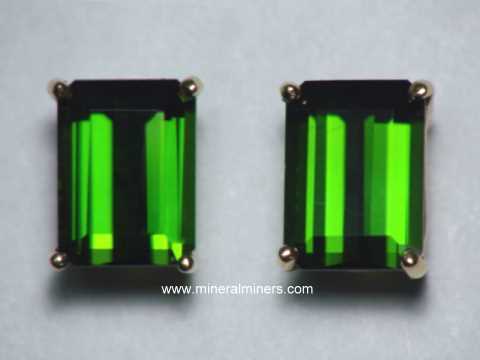 This natural color tourmaline gem is both unheated and untreated. This ring is a size 7.5 and has 3.01 grams of 14k gold. See another photo of this natural color pink tourmaline ring. See also a side view of this natural color flawless pink tourmaline ring. This 14k gold ring was custom crafted in rose gold and set with a very clean oval-shaped large rubellite tourmaline "gem" weighing 4.12 carats with fine deep pink (red) color (100% natural color; this genuine tourmaline gem is both unheated and untreated). 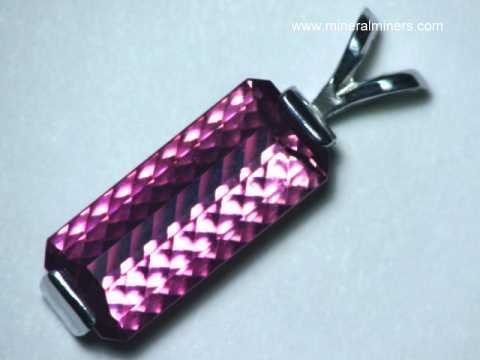 The tourmaline is surrounded by a stepped down, double row of pink sapphire melee weighing 0.33 carat in total weight. This ring is size 7 and is over 9.6 grams in over all weight! 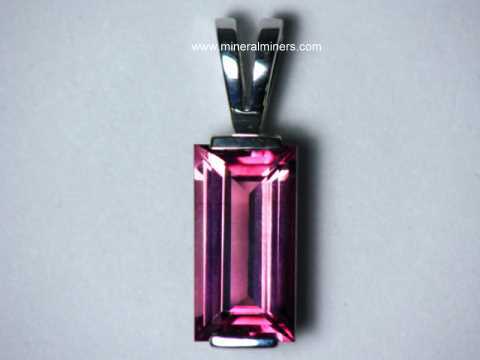 See also a side view photo of this natural rubellite tourmaline jewelry design. This 14k gold ring was custom crafted in yellow gold and set with a very clean, trillion-shaped large rubellite tourmaline "gem" weighing 3.40 carats with fine deep red color (100% natural color; this genuine tourmaline gem is both unheated and untreated). The tourmaline is accented by two pink tourmaline gems, stepped down in a single row, weighing 0.25 carat in total weight. 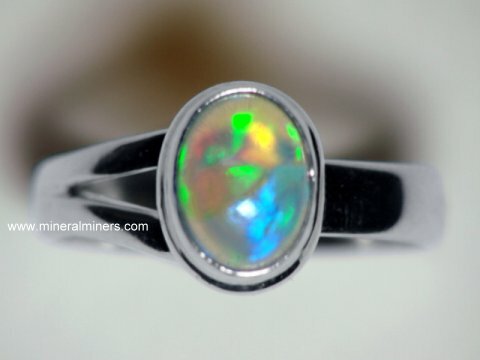 This ring is a size 7, and it is over 4.9 grams in over all weight! 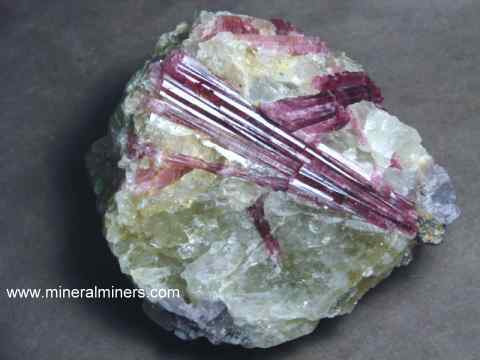 See also a top view photo of this natural red tourmaline jewelry design. 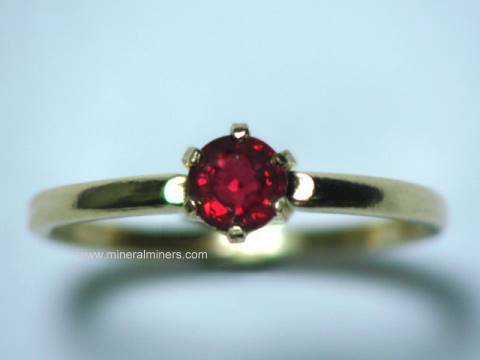 This custom made,(over 5.5 grams)of 14k yellow gold, ring is set with a rubellite tourmaline faceted gemstone with extra fine deep red natural color. This rare quality rubellite gem was very well faceted as a 9mm x 6.5mm oval gem with excellent brilliance, and it is completely eye clean (GIA: Type III Gem, Clarity Grade VVS). 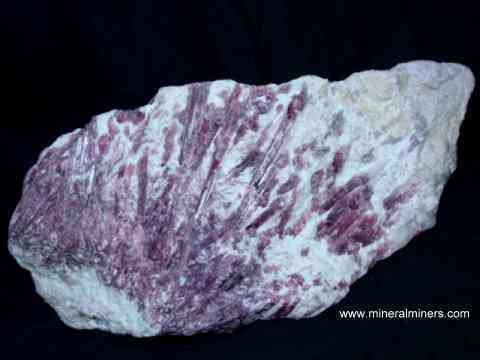 Its wonderful intense red color is completely natural - it is unheated and untreated. See also another view of this natural rubellite tourmaline ring. 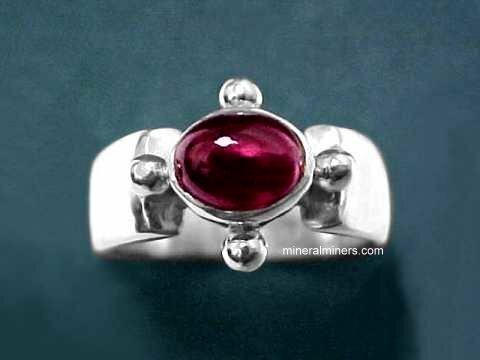 This size 8 sterling silver ring was handcrafted and set with a superior quality lightly included rubellite tourmaline cabochon gem weighing 5 carats with very fine purplish-pink color (100% natural color; unheated and untreated). 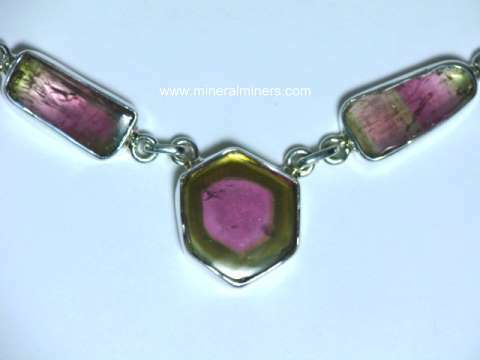 See also a side view of this natural color pink tourmaline jewelry design. This lovely pink tourmaline ring was handcrafted in sterling silver with an open-back setting, then set with a faceted 7mm long checkerboard-top gem of lightly included rubellite tourmaline with fine deep reddish-pink color (100% natural color; this genuine tourmaline is unheated and untreated). This natural pink tourmaline ring was handcrafted in 925 sterling silver and set with a lightly included natural rubellite tourmaline cabochon gem weighing 3 carats with very rich pink natural color. 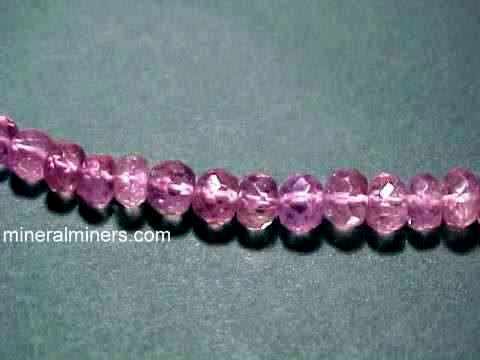 This genuine pink tourmaline gemstone is unheated and untreated. This natural sunset tourmaline ring was handcrafted in 925 sterling silver and set with a lightly included natural rubellite tourmaline cabochon gem weighing 7 carats with very rich dark reddish-purple color (100% natural color; unheated and untreated). This beautiful sunset tourmaline ring is a ring size 8. Our Pink Tourmaline Rings are all set with natural color pink tourmaline gems! Did you know that pink tourmaline rings are a traditional birthstone jewelry gift choice for birthdays in the month of October? 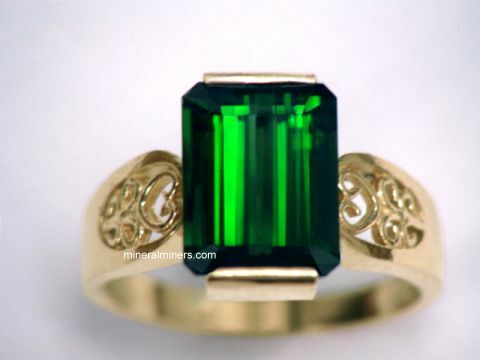 We have a large variety of tourmaline ring styles available with all natural color tourmaline gemstones in many other colors including blue, green, pink and sunset color tourmalines. 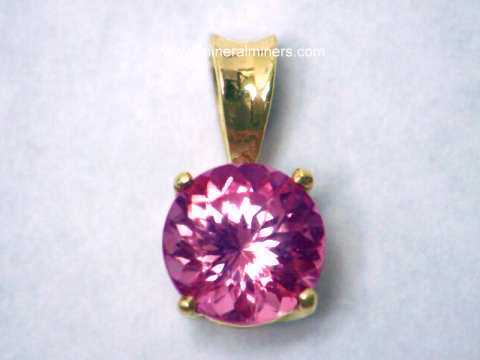 See also our large selection of other genuine pink tourmaline jewelry designs. 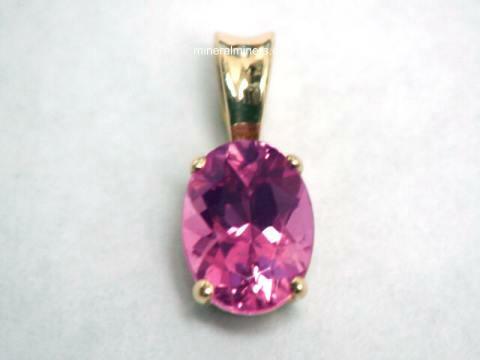 We have all natural pink tourmaline gemstones set into handcrafted pink tourmaline pendants in solid 14k gold and also in pure 925 sterling silver. 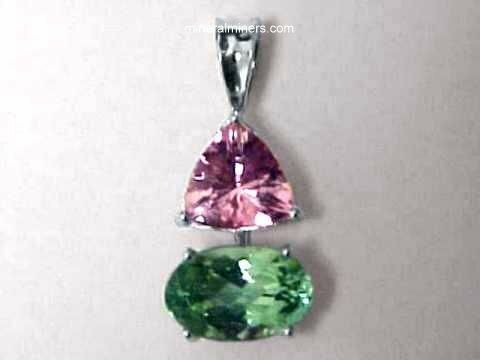 We have a large selection as well of pink tourmaline necklaces & pendants in unusual shapes and sizes that are set in unique styles. Our pink tourmaline rings are all unique one-of-a-kind designs. 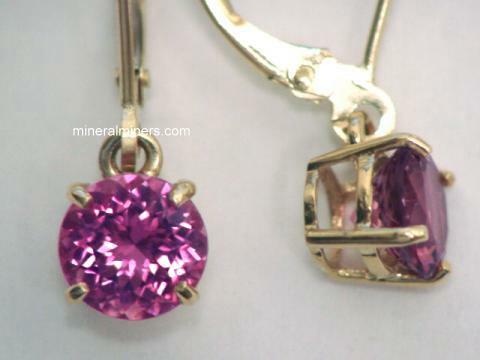 We have pink tourmaline earrings in both leverbacks and stud earrings available in a wide selection of pink tourmaline gemstone sizes with shades of natural color pink ranging from light pinks to deep purple-pink tourmaline gems. Our genuine pink tourmaline earrings are available with a variety of pink tourmaline gemstone shapes including rounds, ovals, pear shapes, and rectangular shaped pink tourmaline gems. Each of our pink tourmaline rings is set with natural color untreated pink tourmaline gemstones that were mined in Brazil, Africa, or Madagascar. 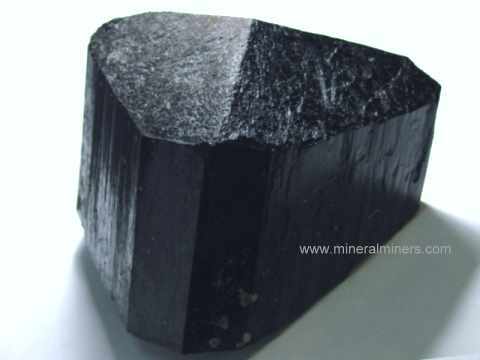 Here at mineralminers.com, we do not have any lab-created pink tourmalines, and we do not have any diffusion treated or heat treated pink tourmalines! 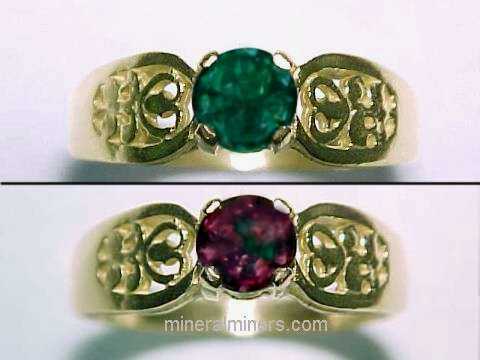 We specialize in genuine natural color pink tourmaline rings that were faceted from natural pink tourmaline crystals. 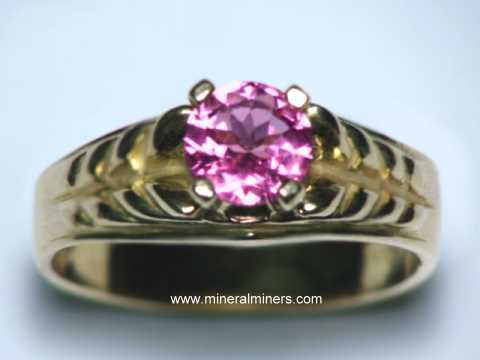 Our pink tourmaline rings are set in solid 14k gold, and we also have 925 sterling silver pink tourmaline ring designs. We have natural pink tourmaline rings available in beautiful shades of light pink to dark pink tourmaline with all natural colors including some amazing sunset tourmaline rings! 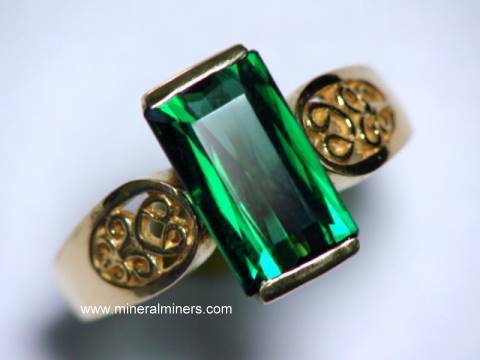 We have a selection of large tourmaline gem sizes and shapes available as well in fine tourmaline 14k gold rings. 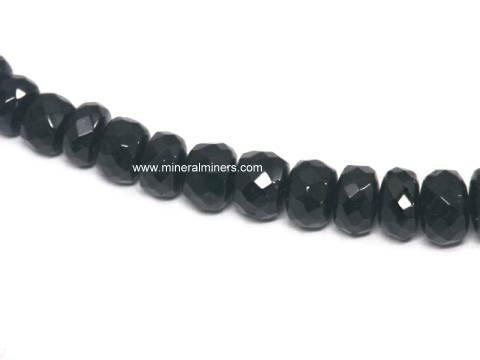 See also our selection of natural color pink tourmaline crystals. 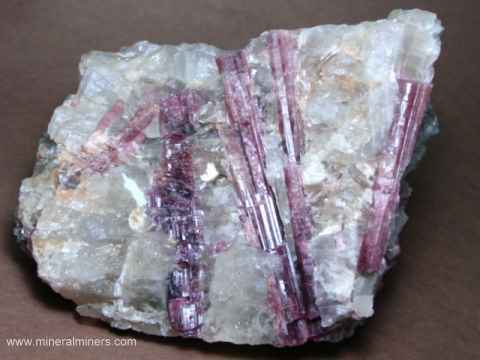 Information about genuine pink Tourmaline and its history, physical properties, chemistry, occurance, and metaphysical uses is displayed on our tourmaline information page. 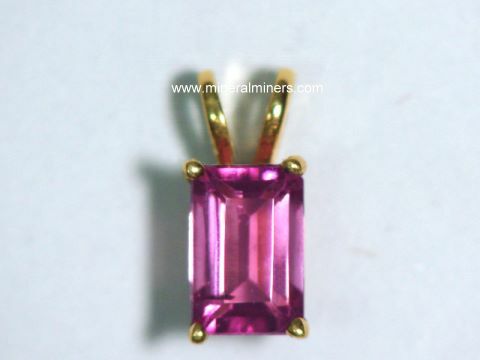 To see more natural pink tourmaline photos, just select another linked image displayed below. 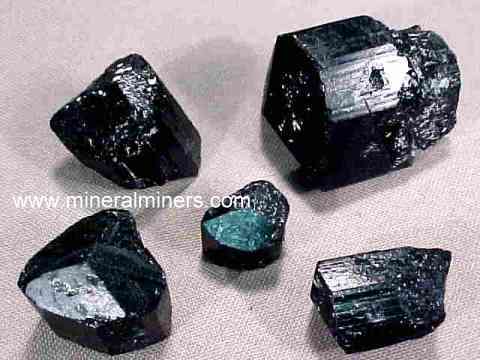 We do have additional pink tourmalines in stock. 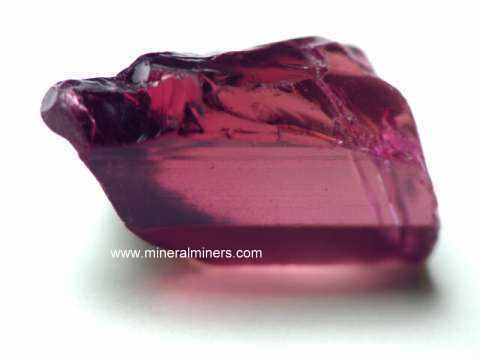 Some of our rare quality pink tourmaline crystals also have gem-grade areas inside and can be used as superior grade pink tourmaline gem faceting rough. 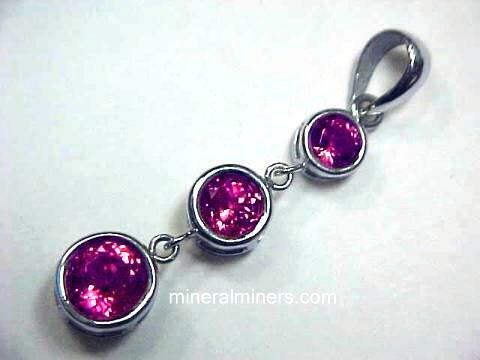 Be sure to let us know if you have any natural pink tourmaline requests. Would you like us to inform you when we add on this page more natural color pink tourmaline rings set in 14k gold in both white gold and yellow gold? We do have additional inventory of natural color pink tourmaline rings in stock, so be sure to let us know if you have any pink tourmaline ring special requests. 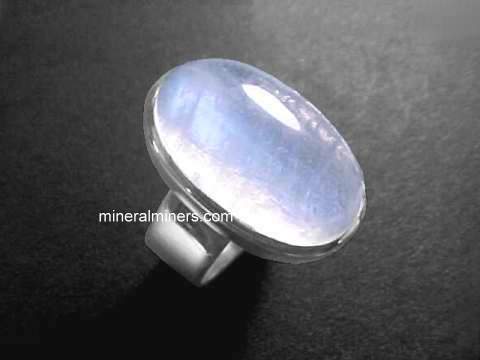 We have a large variety of natural gemstone ring designs available with many different kinds of natural gemstones. 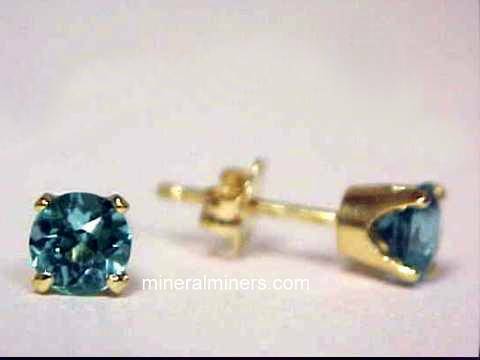 Our selection of natural color aquamarine earrings and aquamarine rings is available with many different aquamarine gemstone shapes and sizes to choose from in both 14k gold and in 925 sterling silver. 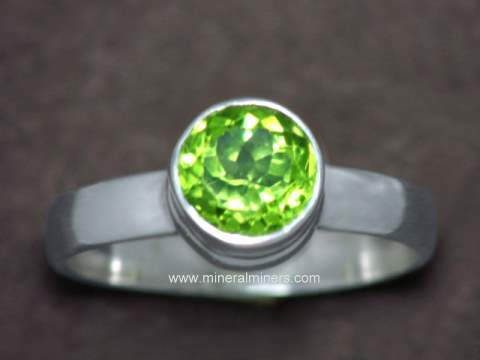 We also have a selection of styles and sizes available in genuine moldavite rings. 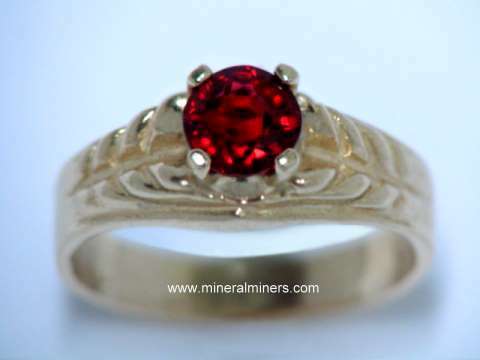 Be sure to see our natural red garnet rings. 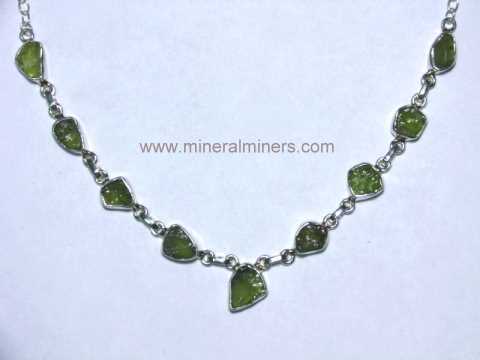 Be sure to also see our genuine peridot earrings and other peridot jewelry designs including handcrafted peridot rings in both sterling silver and 14k gold. 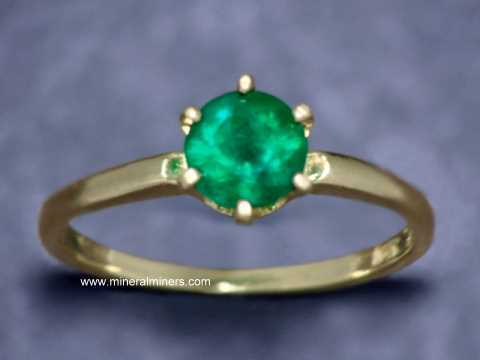 We also have fine emerald rings and emerald earrings in stock, and also a very large selection of natural garnet rings with each of the natural garnet varieties including bright orange mandarin garnet rings and also tsavorite green garnet rings with fine green garnet gems set in solid gold. 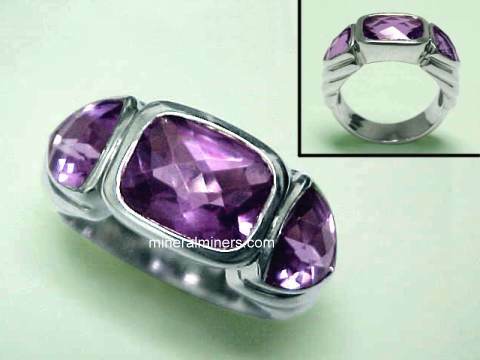 We also have genuine amethyst jewelry designs with beautiful amethyst rings in 925 sterling silver, as well as genuine tanzanite rings. Please contact our webmaster or our 'site' geologist with any questions or comments regarding our natural color pink tourmaline rings.